The flagship 13.3-inch model comes in at just 14.8mm thick and 1.28kg heavy, which is pretty good given that you get an Intel Core i5-6200U "Skylake-U" processor (dual core, base frequency at 2.3GHz, turbo up to 2.7GHz) plus an NVIDIA GeForce 940MX GPU (with 1GB GDDR5 RAM). Of course, Xiaomi just had to point out that this is thinner and lighter than the 13-inch MacBook Air, though it doesn't use a wedge design so it's still bulkier. You also get 8GB of DDR4 RAM, 256GB of SSD via PCIe and one free SATA slot for expansion (but only serviced by Xiaomi). The 40Wh battery should be good for up to 9.5 hours, and it can go from zero to 50 percent in just half an hour using the bundled USB-C charger. The smaller 12.5-inch model is even slimmer and lighter at 12.9mm and 1.07kg, respectively, but you'll have to make do with an Intel Core M3 CPU, no dedicated GPU, just 4GB of RAM and just a 128GB SSD via SATA -- though there's one free PCIe slot if you don't mind letting Xiaomi do the upgrade for you later. And instead of two USB 3.0 ports, you only get one here; but you still have an HDMI port. The upside of this model is that you get two more hours of battery life. The price? 3,499 yuan or about $520. Much likes its bicycles, rice cookers and drones, the Mi Notebook Air is a "Mi Ecosystem" product made by a partner -- in this case, it's Tianmi which literally means "field rice." 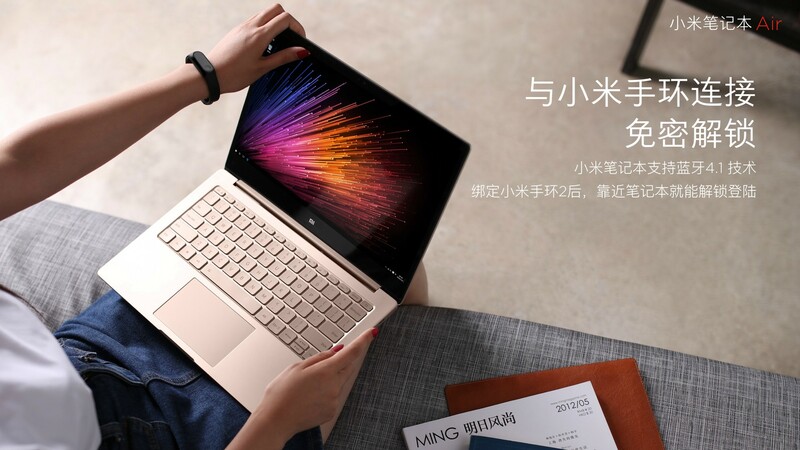 A Xiaomi rep reasoned that the company decided to tap into the laptop market as it identified a potential market to deliver the right balance between performance and portability, as well as to make it easier for young adults to afford a PC for productivity. Still, this is a bold move considering that China's consumer notebook market is expected to contract by 10.4 percent this year, according to IDC analyst Bryan Ma. He added that this is a steeper drop than the US' 7.7 percent and the worldwide 9.3 percent. So what will the Mi Notebook Air contribute to Xiaomi's business in the long term? While it doesn't run on MIUI (Xiaomi's customized Android ROM), it does come with "Mi Sync" software (tentative name translated from Chinese) which should somewhat boost Mi Cloud usage. The laptop can also be automatically unlocked when your Mi Band is within a close proximity. The Mi Notebook Air is launching in China on August 2nd. Again, there's no info regarding global availability for it just yet, so stay tuned for future updates.